The exhaust requirements for a powder coating oven are lower than solvent-based coatings, resulting in energy savings. No drying or flash-off time is required. Parts can be racked closer together on conveyors and pass more quickly through the production line. 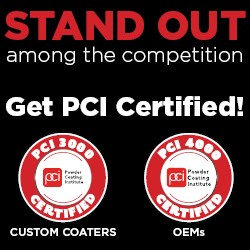 More parts can be coated automatically with fewer rejects because powder coating does not run, drip or sag. With proper application equipment, powder materials and efficient recovery methods, one-coat application and 95%-98% powder utilization efficiency are realizable versus an average of 60% material utilization with an electrostatic liquid system. If more than one color is desired, color changes can be made quickly. Minimal operator training and supervision are required for a powder line. Employees prefer working with dry powder due to the lack of fumes, reduced housekeeping problems and minimum clothing contamination. A simpler coating process leads to less coating errors which results in minimal scrap, reduced labor costs, and reduced operating costs. The permitting process for a powder coating operation is simpler. Compliance with federal and state regulation is also easier, saving both time and money. Powder coating qualifies for the U.S. Green Building Council's LEED program .